With the coming October issue of the Granger comes the start of fall. Now that the summer is done and most of the fairs have ended are we ready for Grange work? I hope everyone enjoyed their vacations and are well rested. I enjoyed mine but I’m not that rested. Aside from most of the fairs I would hope that many of you visited the Big E and the New England Grange Building. Many of the friendly faces you met there are the result of Sisters Doris Shaw and Betty Jane Gardiner. They did an outstanding job again this year in getting volunteers from Connecticut to help out at the building. Thank you both. There will be information in this issue regarding our annual session. Most of it will deal with changes. You probably know by now that we will be meeting in a new hotel. The Comfort Inn and Suites, 900 E. Main St., Meriden, Ct. Those of you old enough to remember it’s the hotel we met in for many years until about ten years ago. The Board of Directors has listened to the wishes of many of the delegates concerned with the cost of our annual session both to the State Grange and to them. 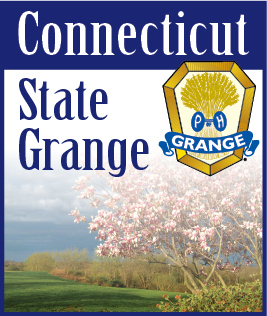 Along with this change and because of it the Sixth Degree conferral will be at Meriden Grange hall. There are other minor changes and I hope they will not be much of an inconvenience. At the close of the session each delegate will be asked to fill out an evaluation sheet to let the board know your feelings and preferences. I am sure that we will still accomplish the work of our annual session. Speaking of which anyone who has not submitted their resolutions to the State Secretary by this time must follow the rules pertaining to late submissions. Please contact Edith Schoell for this information. State officers and committee members and each Grange will have tickets for the pre-session banquet which will be at the hotel at 7:00 p.m. on Wednesday, October 14. Please let Edith Schoell know as soon as possible if you are attending. We started last year off with a bang because of the National Session being in Connecticut. Let’s do the same this year. I look forward to meeting many of you in Meriden this month.